The best novels of all time carry a message while they entertain you. They're written with some of the most beautiful prose, though styles from one novel to the next will vary greatly. 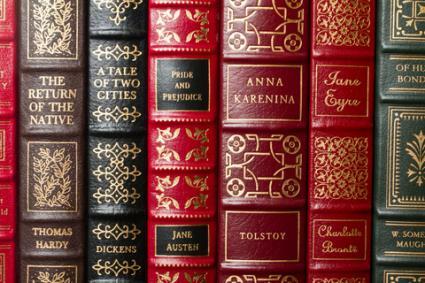 The best classic novels stay with you long after you've read them, and sometimes may tempt you back into their world time and time again. Don Quixote is known as the father of the modern novel and has been translated into English more than a dozen times. According to an article published in The Guardian, top authors say that this title is the greatest book in the world. It tells the story of a fearless knight, Don Quixote, and his adventures with his squire, Sancho. Don Quixote has read so many books concerning chivalry, he's on a quest of his own to save the world from the wicked and help the good guys who need assistance. The first line of Pride and Prejudice is, "It is a truth universally acknowledged, that a single man in possession of a good fortune, must be in want of a wife." In the story, a man fitting that description moves to town and falls in love with one of the five Bennett daughters, Elizabeth-but she's too headstrong to give in at first. The two seem as if they'll never end up together because of rumors, a potential new suitor for Elizabeth Bennett, and other circumstances. In the midst of the type of drama that large families do best, they have a chance to find out the truth about one another. The book holds the number one spot on a list of 101 favorite books in a survey conducted by Australian Bookseller Dymocks. The Adventures of Huckleberry Finn is a classic coming-of-age story about a teenager and his slave, Jim, as they float down the Mississippi River. The danger, rich characters, and seriousness veiled in humor make this one of the best novels ever written. The book holds a prominent spot on the Listverse.com Top 10 Books of All Time list. The Catcher in the Rye is one of the most controversial books of the 20th century and it can often be found on the banned books list. It offers a form of clarity regarding the teenage mind, delving into alienation and disillusionment with the adult world that not many books achieve. According to Entertainment.Time, this book reached the top of the New York Times best-seller list in the second week following its publication and it is still loved today. It holds the top spot on the Fandomania list of 100 Greatest Books. As I Lay Dying is told from multiple perspectives, all of family members, as they travel with the mother's dead body for several days by carriage to the resting place she preferred in Jackson, Mississippi. It is included on the list of top 100 novels published at TheBest100Lists. Scout tells the story of her childhood in Depression-era Alabama. A man named Boo who supposedly never leaves the house leaves gifts for her and her friend Dill, and her lawyer father is defending a black man in court much to his white neighbors' dismay. To Kill a Mockingbird addresses not only prejudice and hatred between the races, but also sends a message to have patience and understanding for everyone. In 2008, participants in a poll conducted by The Telegraph voted To Kill a Mockingbird as the greatest novel of all time. The Great Gatsby is a love story between Gatsby and Daisy, set in the roaring 20's. Gatsby and Daisy met five years before the book begins. They fell in love, but class differences (she was rich and he was poor) kept them apart and she married Tom, a bully. Gatsby is set on making millions and winning Daisy back. With that quest comes all the drama, elegance, and glamour that could be packed into a book of just under 200 pages. The novel is ranked among the all-time great examples of literature by Time Magazine. Gone with the Wind is a lengthy romance that is set in the south during the Civil War. Scarlett begins as a spoiled Southern belle, but as time passes, she is forced to rise to a number of unpleasant occasions. She meets them head-on and shows her inner strength, but she's flawed when it comes to relationships. She's in love with a married man, Ashley, while pushing away charming, roguish suitor Rhett Butler. After he's left her, supposedly for good, Scarlett decides she needs Rhett in her life and sets out to win him back. The book is on Time's list of all-time great novels. Ulysses holds the top spot in the Modern Library's list of the 100 Best Novels, as chosen by the Board of the organization. Joyce details a single day in the life of a common man in Dublin, Ireland, drawing parallels with the epic journey of The Odyssey. It is noted by scholars for its stream-of-consciousness narrative and experimental writing techniques. The Modern Library also created a 100 Best Novels readers'-choice list, and Atlas Shrugged was voted the best book. The novel details Rand's philosophy of objectivism in a story of politics, economics, and the power of the human mind. Included in the Time magazine's list of All-Time 100 Novels and number four on the Modern Library's readers' list, The Lord of the Rings is a sweeping fantasy epic. Tolkien created an enduring and captivating world that influences fantasy authors and literature fans to this day, as well as the millions of movie-goers who have enjoyed seeing the books come to life on the big screen. The Grapes of Wrath is a classic tale of family in the midst of the Great Depression, one of many books that earned John Steinbeck a reputation as a master of American literature. Radcliffe Publishing Course gave it the number three spot, it's number ten on the Modern Library list, and it was also included in the Time list of all-time top novels. 1984 earns a spot on many of the previously mentioned lists, falling at number 13 in the Modern Library rankings. It also holds the number three spot on the Listverse Top 12 Dystopian Novels list. In a bleak future where the government controls all thought, one man hopes for an alternative. The book's concept of "Big Brother" still arises whenever government regulations get a little too invasive or restrictive.